The State Tested Nurse Aide (STNA) in Ohio is a valuable healthcare assistant to the Registered Nurse and Licensed Practical Nurse. Also called a nursing aide, the STNA enjoys a rewarding career helping others who have conditions related to medical issues or aging maintain the highest quality of life possible while under the care of health professionals. The STNA delivers a variety of services from assisting with mobility to taking and recording vital signs for health monitoring. The Ohio Department of Health (ODH) is responsible for approving and managing the Nurse Aide Training and Competency Evaluation Program (NATCEP). ODH contracted with D&S Diversified Technologies to administer the competency examination performs testing for the state of Ohio and the Department of Veterans Affairs. The traditional pathway to becoming a State Tested Nurse Aide in Ohio is completing a state-approved STNA training program and passing the competency exam. However, there are other pathways to meeting STNA certification requirements. Out of state CNAs can submit a Request for Reciprocity to the Ohio Department of Health. The applicant must have completed training and testing that meets federal curriculum requirements and must be in good standing on the out of state Registry. Nursing students currently enrolled in a state-approved pre-licensure program of nursing education in Ohio or another state can request permission to waive training and only take the competency exam. The coursework had to include infection control, personal care, emergency procedures and safety. The nursing school director must approve a waiver request form. Foreign-trained nurses and nurse aides can also request a training waiver. Contact the Ohio Department of Health with questions concerning any type of training waivers. An individual can request to take the competency exam without additional training if the person has the equivalent of 12 months or more full-time employment in the preceding five years as a hospital orderly or aide. A military person who can provide documentation that he or she was worked the equivalent of 12 or more months in the preceding 60 months (5 years), as a full-time employee delivering direct patient care that includes the typical duties of a STNA, can request to have the nurse aide training requirement waived in order to sit for the Ohio Nurse Aide exam. A Healthcare Specialist, Medical Specialist, and Hospital Corpsman may also request this waiver by submitting proof he or she worked at least 1600 hours delivering direct patient care that includes the normal duties of the STNA. If an individual must complete a state-approved STNA training program, the first step is selecting the school or educational facility. There are 260 STNA training programs in Ohio, making it easy for most people to find a training provider in their local area. STNA classes in Ohio are offered at community colleges, training centers, nursing homes, assisted living facilities, health care centers, rehabilitation centers, high schools, vocational schools and technical education facilities. 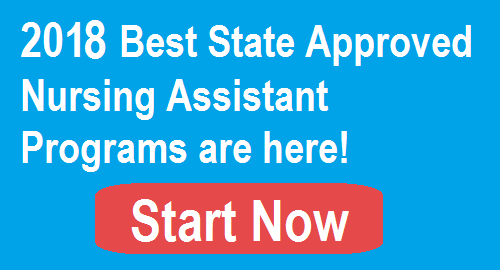 The following table lists 260 state-approved STNA programs in Ohio. The data is updated in July 2017. Program costs vary quite a bit, and the STNA school can change the rates at any time. Warren County Career Center currently charges $820 for the nurse aide course, WorkKeys assessment fee, scrubs, textbooks and testing fees. Columbus State Community College charges $135.93 per credit, meaning three credits cost $407.79, but there will be other fees and expenses for textbooks, scrubs, supplies and exam fees. The cost of tuition and fees alone could be as high as $1,500 at some schools, so it pays to do research. Financial aid in some form may be available through the school. If not available, there are other options like private scholarships and state workforce training funds. However, most schools will assist students with the cost of training by offering payment plans. Always check with the financial aid office if financial assistance is needed. There is a way to get free training. Federal and state law require medical and residential facilities funded by Medicare and Medicaid to cover the student’s cost of training and testing to become a STNA. This includes training, testing, textbooks and supplies. A student can work in the facility while training for up to four months without earning STNA status, but after that time the person is not allowed to work any longer. A person who is hired by a nursing home within 12 months after completing training, and it is their first nursing home position, can get reimbursement for training and testing fees. In addition, an active duty service member, or someone who is a retired service member or veteran, can request reimbursement of exam fees. The fees must first be paid upfront to D&S Diversified Technologies. Each STNA training program has prerequisites. Ohio does not require a criminal background check to enroll in a nurse aide training course. However, many programs require the student pass a background check because they will be doing hands-on clinical training with patients. They will have to pass a background check anyway once employed. The state also does not require students to have a physical and TB test if not employed by a facility. Once again, the school and/or the facility may require the student to have a physical and TB test. The training program teaches students the knowledge and skills needed to deliver direct patient care in a safe and beneficial manner. An Ohio state-approved STNA training program cannot be less than 75 hours per the law. The program must consist of at least 59 hours of classroom training with the remaining 16 hours consisting of supervised clinical training provided only in a nursing home. The skills training includes tasks like hand washing, ambulation using a gait belt, denture care, dressing the resident, feeding the dependent resident, making an occupied bed, positioning resident, improving resident’s range of motion, taking and recording vital signs, and many more skills directly related to helping the patient or resident stay safe, comfortable, hygienic and achieve the highest possible quality of life. The Ohio STNA exam consists of a Knowledge or Written Test and a Skill Test. There are 79 multiple choice questions that are based on material taught in the state-approved STNA training curriculum. The student must get a score of 80 percent or higher to pass the knowledge test. The skill test requires the nurse aide student to demonstrate five skill tasks. One skill is Hand Washing, and the other four skills are randomly selected. It is necessary to get a score of 80 percent or higher to pass this portion of the test. If the student fails one task, he or she will have to retake the entire skill test again, but one of the skills will be the one the student failed to properly complete. If the student fails two tasks, he or she will have to retake the entire skill test again, consisting of Hand Washing and four randomly selected skills. An individual is allowed three attempts within the 24-month period after the end of the training program to pass both sections of the test. Once a student successfully completes a state-approved training program, he or she will receive an ODH Certificate of Completion. The certificate is needed to register to take the nurse aide competency exam. The exam is administered by the D&S Diversified Technologies testing section called Headmaster. Federal law requires states to maintain a Nurse Aide Registry which contains names of people who have met minimum training requirements and passed a competency examination to work in a federally funded medical or healthcare facility. Once an applicant passes the Knowledge Test and Skill Test, D&S Diversified Technologies will notify the Ohio Nurse Aide Registry. Once the person’s name is entered in the Registry, STNA certification is active for 24 months. A State Tested Nurse Aide in Ohio can renew STNA certification only if able to provide proof of working at least 7.5 consecutive hours or eight hours over a 2-day (48-hours) period as a paid STNA within the prior two years (24 months). The 24-month period begins when the STNA’s name was first placed in the Registry or the most recent date when working hours were verified. The employer provides the verification of employment. Meet the requirements of enrolling in a nursing education program and show proof of completing the courses that teach basic nursing skills or show proof of having worked the equivalent of 12 months of full-time employment as an orderly or hospital aide in the prior five years AND have passed a competency evaluation program. These regulations are per Ohio administrative code 3701-17-07.41.